Students from all areas of campus came together Thursday, April 9, to raise money and awareness for causes close to their hearts. Belmont’s International Justice Mission (IJM) and Alpha Tau Omega (ATO) chapters set up camp underneath the Bell Tower for a day full of awareness and change. Passersby may have wondered why students were dressed in funny clothing, running around and “capturing” their friends to throw them into a makeshift jail. The answer? Jailbreak – an annual event where ATO members raise money for their philanthropy, Blood: Water Mission, by “placing a bounty,” or pledging a dollar amount to have friends put in their jail by member deputies. The event also included a cook-out and musical performances from Belmont musicians Katherine Munoz, Haylee Page, Monica Moser, Sawyer, Chip Colon, Michael D’Errico and Kiya Lacey. ATO raised more than $6,000 through the participation of more than 500 people. A representative from the national fraternity’s headquarters filmed the event to be used for ATO Roadshow, an outlet that showcases worthy chapter events to ATO members on a national level. Jailbreak’s video will be shown to chapters at national conventions and leadership seminars, as well as on the fraternity’s website. “All of our philanthropy events are open to the Belmont community, but this year our goal was to have the bands incite more of a welcomed feeling for everyone. I think events like JailBreak show people that a group of college men are capable of throwing an incredibly successful event for something bigger than themselves… Not many organizations have the capacity to have such an impact on the community they are present in,” said Chapter President Robert Storrow. For information on Belmont’s ATO chapter, click here. 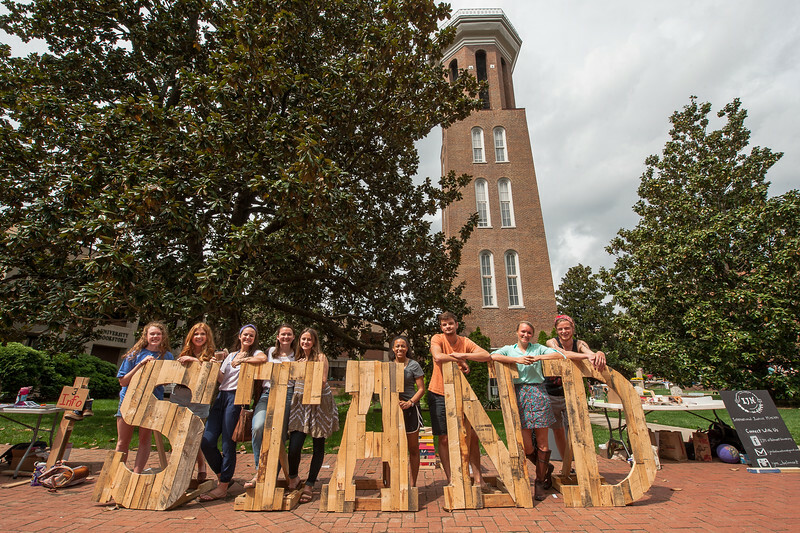 Around the corner from ATO’s makeshift jail, event attendees found five giant wooden letters, spelling out “STAND,” and many students who looked like they had not slept all night, while still maintaining a smile from ear to ear. IJM‘s worldwide Stand 4 Freedom event was created to bring awareness to the issue of human trafficking in the U.S. and all over the world. Students stand for 24 hours straight for the victims of human trafficking and sign petitions to be sent to the IJM headquarters. IJM then collects all of the signatures from every campus across the nation who participated and delivers them to Congress. The first petition is the End Modern Slavery Initiative Act of 2015, which would enact proven anti-slavery models on a worldwide scale: freeing millions of families and fixing whole justice systems. The second petition was for the United Nations, and it calls for help to protect the poor against everyday violence. This petition asks Secretary General Ban Ki-Moon to include ending everyday violence efforts in the 2015 sustainable development goals so that protection from violence for the poor and strengthening the justice systems will be a priority. While not every attendee stood the whole day, those who did experienced a new appreciation for the cause. STAND kicked off with a worship service at 7 p.m. on Wednesday night, with a small group praying for the individuals who are currently suffering and later included kickball, four square and hide and seek during the early morning hours. When dawn arrived, others came to learn about IJM, sign the petition and enjoy free donuts and henna tattoos. By 7 p.m. Thursday night, IJM received more than 600 signatures on the petition. For information on how to be involved with IJM at Belmont, click here.